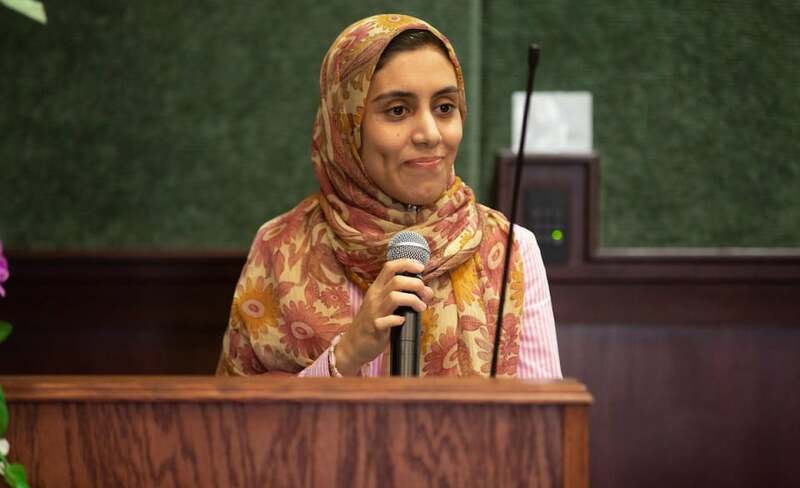 Fatemeh Mostafavikhatam, a physics graduate student under the supervision of Dr. Hamidreza Ramezani, received the award for Outstanding International Female Student. Dr. Volker Quetschke, associate professor of physics and astronomy, presented her with a plaque and flowers. “This award is very motivating for me because after a lot of hard work I put into my research here in the United States … and I found that at the end, my results are recognized by the university and they have this type of meeting to encourage students that their effort is seen and rewarded by the university. So, it’s important to me,” Mostafavikhatam said. Physics and Astronomy department faculty members have been recognized at the UTRGV College of Sciences Research Symposium held Friday, March 29, 2019. Dr. Hyun-chul Lee has been awarded the 2018-19 Teaching Excellence Prize, while Dr. Volker Quetschke has received the 2018-19 Service Excellence award. The department congratulates Dr. Lee and Dr. Quetschke for their wonderful accomplishments. 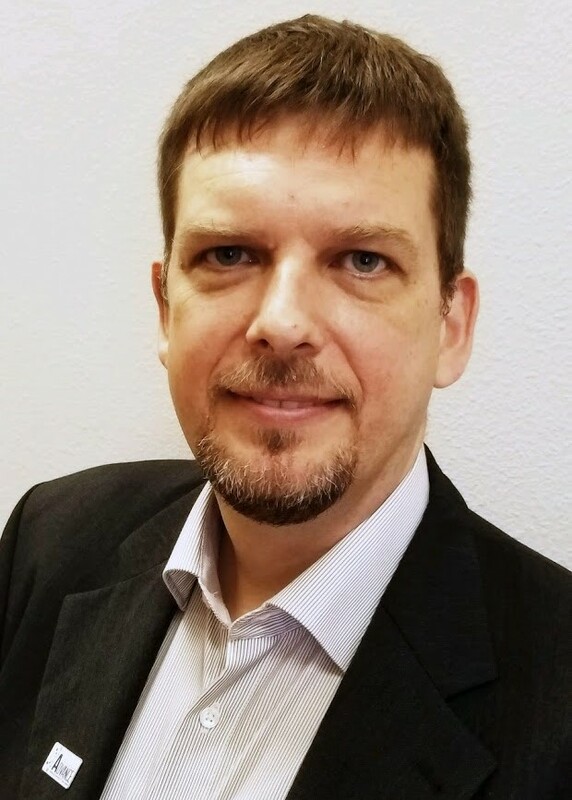 Dr. Volker Quetschke was elected Co-chair for Academic Affairs and Faculty Quality at the University of Texas System Faculty Advisory Council (FAC) meeting at Austin on January 31, 2019. This position is one of ten seats of Faculty Advisory Council Executive Committee. The FAC is an advisory group selected from the faculty of UT System institutions. FAC works with and on behalf of the UT System, with a primary mission of communicating ideas and information between faculty and UT System Executive Officers and Board of Regents. FAC works on identifying issues of concern to the faculty, Board of Regents or well-being of the U.T. System and is charged with responding to issues at the request of the Board of Regents, Chancellor, U.T. System Administration, and/or FAC membership. The FAC committee for Academic Affairs and Faculty Quality is one of three standing committees and works on faculty and education related aspects of the overall FAC mission. Currently, the committee focuses on free-speech guideline recommendations and on recommendations concerning full-time non-tenure system faculty at the University of Texas System Academic Campuses. 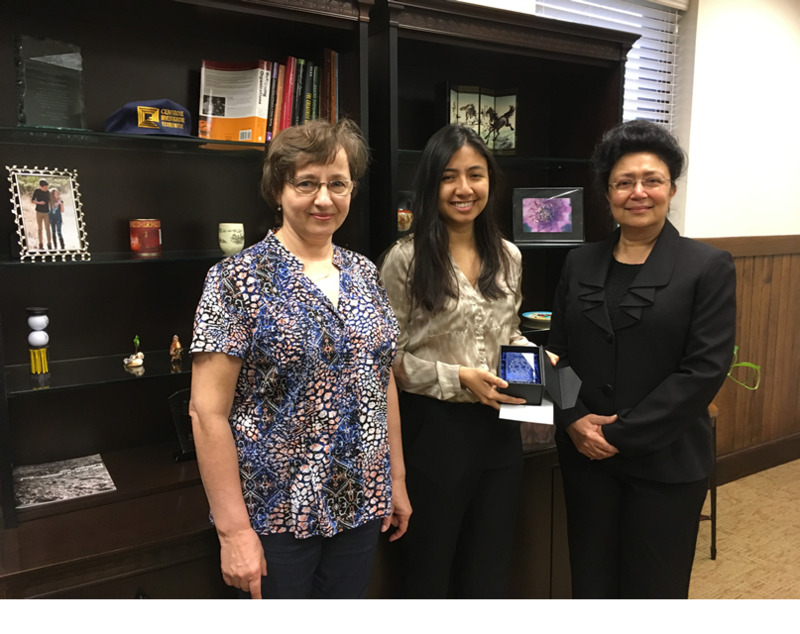 (Jan. 2018) Alondra Escobar, a student in the Biophysics Research Laboratory, received an award from the Chemical and Biomolecular Engineering Department for Best Presentation in Materials Science at the Gulf Coast Undergraduate Research Symposium at Rice University on November 4, 2017. Alondra and her mentors, Drs. Natalia and Juan Guevara, have designed and developed a nanoscale optical microscopy system to study live human blood cells in buffered saline. Their invention makes it possible to obtain high resolution images of the complete surface of a single cell thereby creating an accurate record of cell size, volume, and topography. Alondra's aim is to create an atlas of human blood cells that can be used to identify anomalies that correlate to infectious diseases, genetic disorders, and malignancies. The Gulf Coast Undergraduate Research Symposium is hosted by Rice University in Houston, Texas. It is a forum for undergraduate researchers to present original research discoveries. Every presenter will be judged by Rice faculty, visiting faculty, and/or graduate students in their respective Divisions for excellence in research and clarity of delivery. Each Division determines the awards and prizes. This year the award for Best Presentation in Materials Science and NanoEngineering went to Alondra Escobar from the Department of Physics and Astronomy. Congratulations! 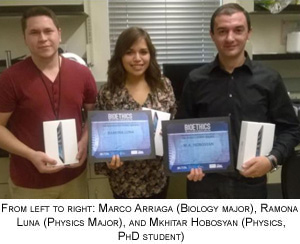 (Feb. 2018) Physics graduate students Nareg Ohannesian and Anton Gribovskiy won the first and second prizes, respectively, at the UTRGV Graduate Research Symposium within the College of Sciences. 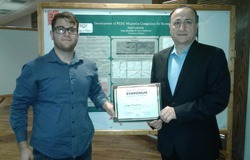 MS student Nareg Ohannesian, conducting research under the supervision of Dr. Martirosyan, won the first place for his work entitled "Development of PEEK-Magnetite Composites for Biomedical Applications". 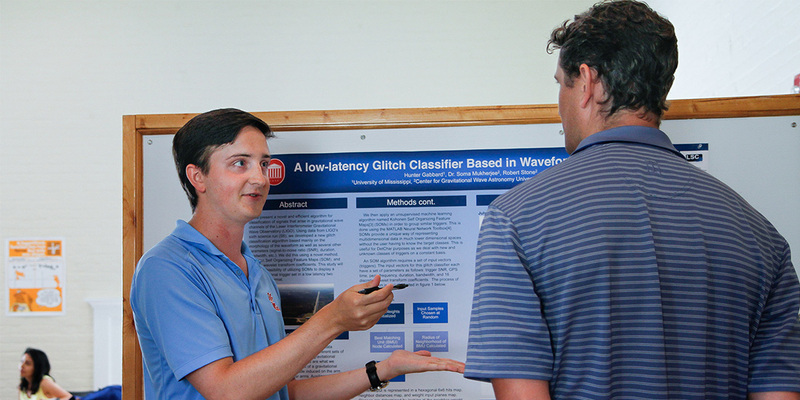 Anton Gribovskiy won the second place for his work entitled "Analysis of Optical Properties of Integrated Silicon Microring Resonators Using GHz Modulation Techniques". Anton conducts research under the supervision of Dr. Rakhmanov and is a student in the Cooperative UTRGV - UT Arlington Ph.D. Program. The first Graduate Research Symposium at UTRGV lasted two days and took place at both campuses. On Feb 27 the event started on Edinburg Campus and on Feb 28 it continued its venue on Brownsville Campus. Organized and conducted by the Graduate College UTRGV this was the first major research conference focused on our graduate students. The goal is to make it an annual conference and grow its size to include more students and widen its research coverage in the future. Participating students come from all colleges of UTRGV, making the conference a truly inter-disciplinary and broad spectrum event. Coordinating presentations of the participants from all departments of UTRGV was a challenge. However, the event went smoothly and the feedback was very positive. "Research is a vital component of graduate studies, particularly at UTRGV as we progress towards becoming an emerging research institution", said Dr. Dave Jackson, Dean of Graduate College. The special feature of this Conference is a student's competition for best poster presentations. The Graduate College set aside the funds for a number of cash prizes awarding the first and second place winners ($1000 and $500). The participants competed within their respective colleges with one or two awards per college. This year the first and second prize went to Nareg Ohannesian and Anton Gribovskiy from the Department of Physics and Astronomy. Congratulations! Prof. Mohanty was invited to deliver lectures on gravitational wave data analysis at the Chinese Academy of Sciences. Dr. Mohanty was invited to deliver lectures on gravitational wave data analysis at the Chinese Academy of Sciences, Beijing, from Dec 2 to Dec 10, 2017. In the week-long series of lectures and labs, students learnt the fundamentals of statistical data analysis tools used in gravitational wave astronomy. In addition to the lecture series, Dr. Mohanty gave invited talks at the Kavli Institute for Astronomy and Astrophysics at Peking University, the Yau Mathematical Sciences Center at Tsinghua University, Wuhan University and the Center for Gravitational Experiments at the Huazhong University of Science and Technology. 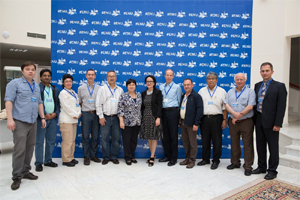 The image shows Dr. Mohanty (5th from the left) with participants of the lecture series at the Chinese Academy of Sciences (click on image for larger view). The Nobel Prize in Physics 2017 was awarded to Rainer Weiss, a professor at the Massachusetts Institute of Technology, and Kip Thorne and Barry Barish, both of the California Institute of Technology. Profs. R Weiss and K. Thorne are the founders of the LIGO project. See CGWA press release. The LIGO Scientific Collaboration and the Virgo collaboration report the first joint detection of gravitational waves with both the LIGO and Virgo detectors. This is the fourth announced detection of a binary black hole system and the first significant gravitational-wave signal recorded by the Virgo detector and highlights the scientific potential of a three-detector network of gravitational-wave detectors. See CGWA press release. The National Science Foundation has selected Professor Matthew Benacquista of the Department of Physics and Astronomy to serve as a program director in the Division of Astronomy. His initial appointment is for one year, renewable for up to three years. The NSF will benefit from Dr. Benacquista's technical expertise to enhance the management, operation, and evaluation of the programs with the Astronomy Division. Dr. Benacquista's duties at the NSF will include long-range planning and budget development for astronomy, and advising the community of current and future funding opportunities. He will also be responsible for coordinating and collaborating with other programs in the NSF as well as other Federal agencies and organizations. He will begin working at the new NSF headquarters in Alexandria, Va on October 2, 2017. He will be supported in this appointment through a $180,000 grant to UTRGV from the NSF. UTRGV will benefit from Dr. Benacquista's knowledge and experiences that he will gain working in the program on policy-level matters and issues involving Astronomy at the Federal level. Prof. Mohanty was invited to lecture at the "3rd International Winter School on Big Data", Feb 13-17, 2017, Bari, Italy. For the first time, scientists have directly detected gravitational waves - ripples in space and time - in addition to light from the spectacular collision of two neutron stars. This marks the first time that a cosmic event has been viewed in both gravitational waves and light. Several astronomers, UTRGV-CGWA among them, participated in the discovery. See CGWA press release, Mario Diaz statement, UTRGV press release. (Feb. 2016) For the first time, scientists have observed ripples in the fabric of spacetime called gravitational waves, arriving at the earth from a cataclysmic event in the distant universe. This confirms a major prediction of Albert Einstein's 1915 general theory of relativity and opens an unprecedented new window onto the cosmos. 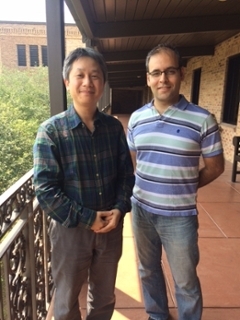 Professors Hamidreza Ramezani and Myoung-Hwan Kim, Assistant Professors in the department of Physics, have each received the prestigious Valley STAR award from the University of Texas System in Spring 2016. The award to Myoung-Hwan has been granted for his proposal on Mid/Far infrared spectroscopy and microscopy system. The award to Hamidreza has been granted for his proposal on Exploring non-Hermitian Physics. In August of 2004, The University of Texas System Board of Regents approved an allocation of funds to be awarded to System institutions to help attract and retain the best qualified faculty. The STAR (Science and Technology Acquisition and Retention) program provides funding to help purchase state-of-the-art research equipment and make necessary laboratory renovations to encourage faculty members to perform their research at a UT institution. (See: https://www.utsystem.edu/offices/academic-affairs/stars-program). Dr. Ramezani has come to the UTRGV from the University of California, Berkeley, in January 2016. Dr. Kim joined at the same time from the Columbia University. Mr. Kareem Wahid, Physics Major graduating this Spring, was awarded the inaugural UTRGV Honors College Excellence Award for the Best Honors Thesis. This is a single award given every year. Dr. Malik Rakhmanov (right), Associate Professor of Physics, received the 2016 New Faculty Support Program Mentor Award at a ceremony held May 5 in the Ballroom at the Edinburg Campus. 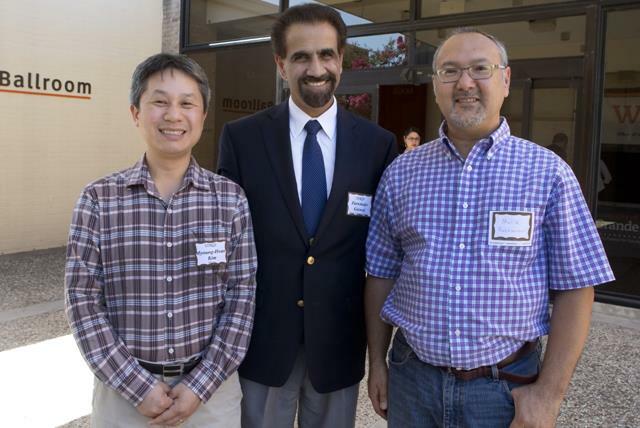 Pictured left to right with Rakhmanov are Dr. Myoung-Hwan Kim, his mentee who nominated him for the award, and Dr. Parwinder Grewal, Dean of the College of Sciences. Mr. Kareem Wahid, Physics Major at UTRGV, has received an award from the American Physical Society (APS) at its March 2016 meeting at Baltimore. Kareem receives this prize for being among the top undergraduate presenters at the APS Meeting. Kareem's research project has been advised by Dr. Yuanbing Mao, Associate Professor in the Department of Chemistry at UTRGV. 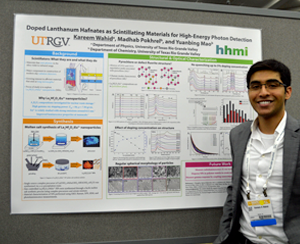 The project, titled "Doped lanthanum hafnates as scintillating materials for high energy photon detection" is a collaboration between the Department of Physics and the Department of Chemistry, and also includes post-doctoral fellow, Madhab Pokhrel. Congratulations! 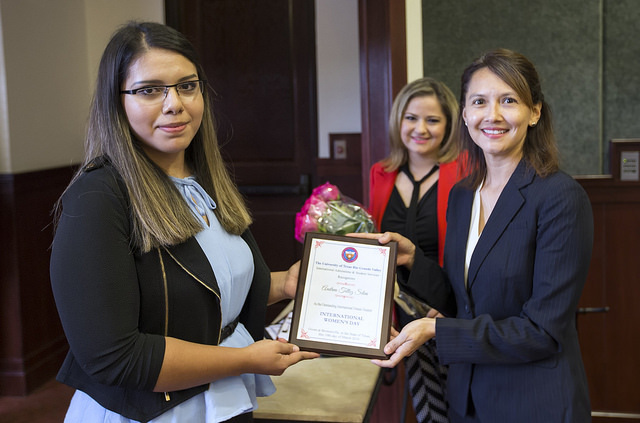 International Women's Day was celebrated on the UTRGV Brownsville campus Thursday. Andrea Silva was selected as the Outstanding International Female Student. Dr. Karina Stiles-Cox, Chair of the Women's Faculty Network, presented her with the award. UTRGV. Andrea is a Physics Major. She is planning to graduate with a Bachelor's degree in Spring 2016. 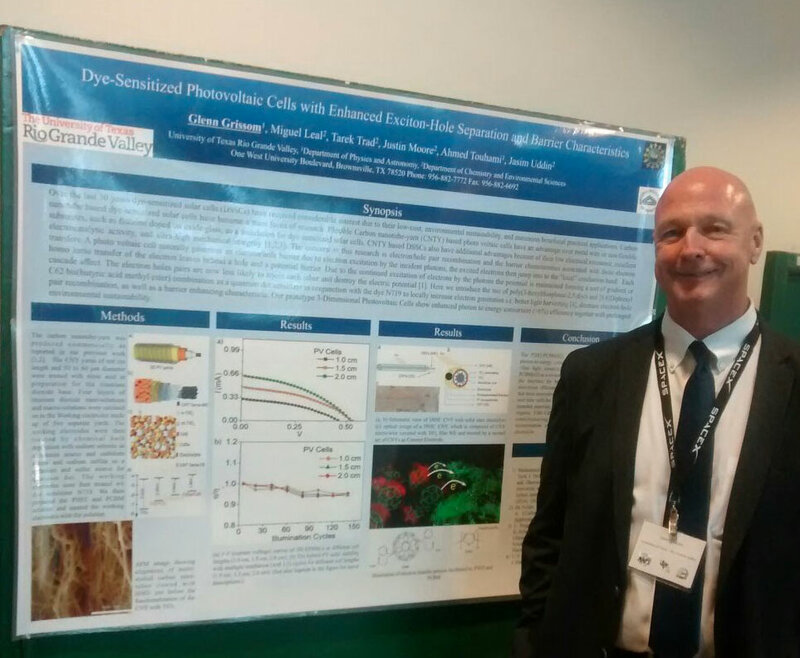 Andrea has been actively involved in undergraduate research under the supervision of Dr. Volker Quetschke. She has presented her research at many national and international conferences. She plans to pursue graduate study in Physics at UTRGV. 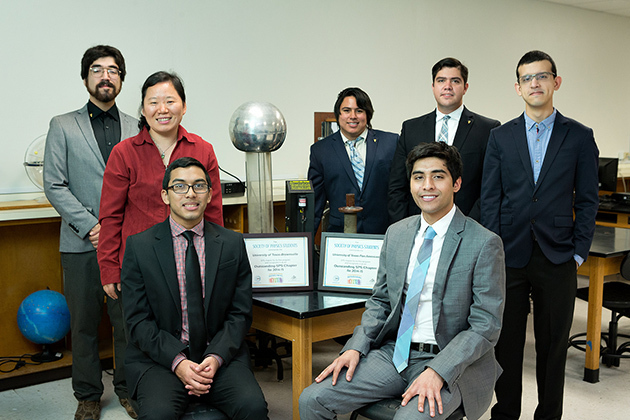 UTRGV Society of Physics Students named "Outstanding Chapter"
RIO GRANDE VALLEY, TEXAS - MARCH 7, 2016 - Demonstrating the wonders of physics and inspiring the next generation of physicists has earned the UTRGV Society of Physics Students (SPS) honors as an Outstanding Chapter for 2015 by the SPS National Council. This is the first time the student group has earned "Outstanding" honors among schools in Zone 13. It is the top accolade from the National Council for community efforts and student outreach. Last year, the UTRGV SPS Chapter won the Distinguished Chapter award. Ms. Srbuhi Yolchinian and Mr. Glenn Grissom, both M.S. Physics students at UTRGV were among winners in American Physical Society's (APS) poster presentation competition at the Texas Section of APS (TSAPS) meeting in Fall 2015, held at the Baylor University in Waco, TX. The award carries a cash prize. Ms. Yolchinian's presentation was titled "Shape-dependent nanoenergetic gas generators based on bismuth trioxide nanoparticles". Ms. Yolchinian's research project has been supervised by Dr. Karen Martirosyan, Professor in the Physics department and Associate Dean of Research in the College of Sciences. Mr. Glenn Grissom's research, titled "Dye-Sensitized Photovoltaic Cells with Enhanced Exciton-Hole Separation and Barrier", has been supervised by Dr. Ahmed Touhami, Associate Professor in the Physics department. Ms. Srbuhi Yolchinian and Mr. Glenn Grissom, both M.S. Physics students at UTRGV were among winners in American Physical Society’s (APS) poster presentation competition at the Texas Section of APS (TSAPS) meeting in Fall 2015, held at the Baylor University in Waco, TX. The award carries a cash prize. Ms. Yolchinian’s presentation was titled “Shape-dependent nanoenergetic gas generators based on bismuth trioxide nanoparticles”. Ms. Yolchinian’s research project has been supervised by Dr. Karen Martirosyan, Professor in the Physics department and Associate Dean of Research in the College of Sciences. Mr. Glenn Grissom’s research, titled “Dye-Sensitized Photovoltaic Cells with Enhanced Exciton-Hole Separation and Barrier”, has been supervised by Dr. Ahmed Touhami, Associate Professor in the Physics department. (Nov. 2015) The Annual Biomedical Research Conference for Minority Students (ABRCMS) was held in Seattle, Washington on Nov. 11-14th, 2015. Three UTRGV students from the two RISE programs (College of Science and College of Health Affairs), out of over 2000 presenters, received first prize in their categories. We are proud to report that Ramona Luna a physics major student in our department received the first prize in the Engineering, Physics, and Mathematics discipline. Ramona presented her research work as a Poster Titled: “Synthetization and Characterization of Chitosan Films and Gels”. Ramona is doing her research work with Dr. A. Touhami the PI of the Single Molecule Biophysics Laboratory at UTRGV. BROWNSVILLE, TEXAS – AUGUST 18, 2015 – For the fourth year, the University of Texas at Brownsville/Texas Southmost College’s Center for Gravitational Wave Astronomy and the Department of Physics and Astronomy is hosting a program titled Research Experiences for Undergraduates and Research Experiences for Teachers in Physics. The 10-week program provides an opportunity for eight undergraduate students from across the country and two local high school teachers to perform research with members of the Department of Physics and Astronomy at UTB/TSC. 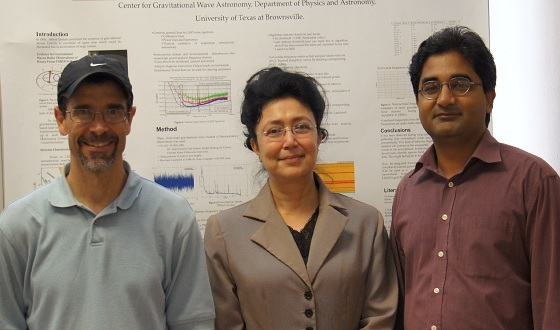 (Aug. 2015) The National Science Foundation has awarded Physics professors Dr. Joseph Romano, Dr. Joey Key, Dr. Soumya D. Mohanty and Dr. Soma Mukherjee a $450,000 grant for the period 2016-2018.This award will support research projects in the area of gravitational wave astronomy. (Mar. 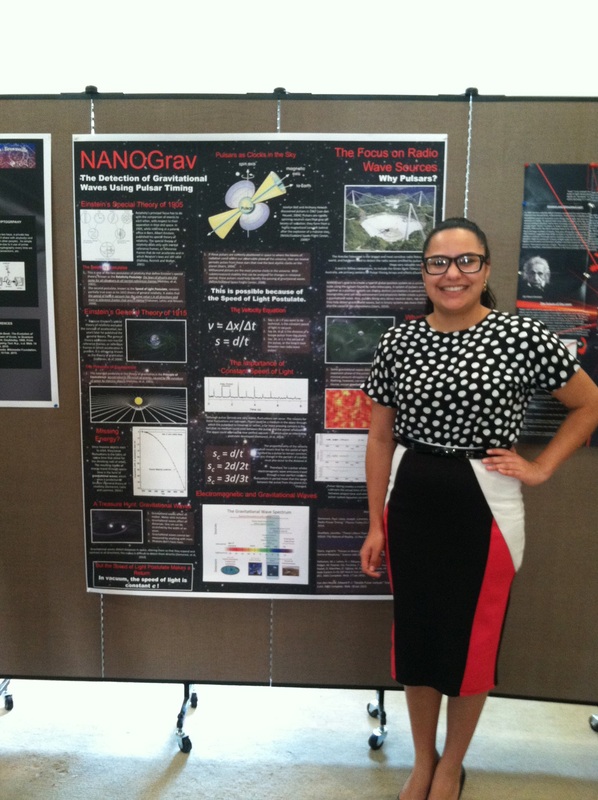 2015) Dr. Cristina Torres, Research Assistant Professor in the department of Physics and the Center for Gravitational Wave Astronomy passed away on March 9 evening in Brownsville. We deeply mourn the loss of our dear colleague and friend whose rich contribution to science and to the community has left a lasting touch. Cristina will forever be remembered by her innumerable students, colleagues and friends across the Americas and the world. Her dedication to work, commitment to the students and her ability to reach out to people will remain an inspiration. Our deepest condolence goes out to her family. Cristina will live in our hearts always. (Feb. 2015) The 2015 UTB/TSC Physics and Astronomy High School Research Poster Competition included 13 high school students participating from 5 different high schools with 7 physics department faculty mentors. Student research posters were presented on Saturday, February 21 in Cavalry Hall at UTB/TSC to 3 judges from the physics department. The top project was presented by Tanya Llanes from Pace High School on NANOGrav: The Detection of Gravitational Waves Using Pulsar Timing. (Feb. 2015) The Center for Advanced Radio Astronomy (CARA) at The University of Texas Brownsville and the National Radio Astronomy Observatory (NRAO) signed a Memorandum of Understanding (MOU) on Friday, Jan. 23 in Charlottesville, Va. The purpose of the MOU is to lay the groundwork for the two entities to collaborate on new initiatives and frontier radio astronomical technologies. (Feb. 2015) Applications for the Research Experience for Undergraduates (REU) and Research Experience for Teachers (RET) programs are due on March 16, 2015 for paid summer research at UTB/TSC May 31-August 7, 2015. Selected undergraduate students and K-12 teachers will spend the summer at UTB/TSC working on research projects in astrophysics, biophysics, gravitational wave detection, lasers and photonics, nano-science and advanced materials or radio, optical astronomy and applied physics. Participants will receive a stipend of $5,000, travel support up to $600, and room and board. 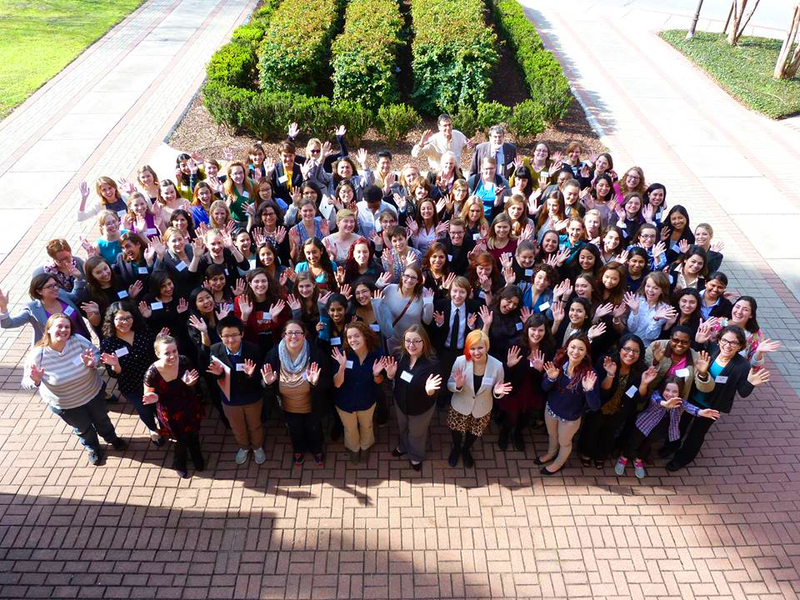 (Jan. 2015) The UTB/TSC Department of Physics and Astronomy hosted the regional American Physical Society (APS) Conference for Undergraduate Women in Physics (CUWiP) at UTB/TSC January 15-17. The conference included a public outreach event aiming to attract women into the fields of Science, Technology, Engineering and Mathematics (STEM). Sarah Thornton, Ph.D. candidate from the Stanford Center for Automotive Research laboratory, was the distinguished speaker for “From High School to Implementing Ethics on Automated Vehicles", where she talked about her experiences as a gradate student in physics. 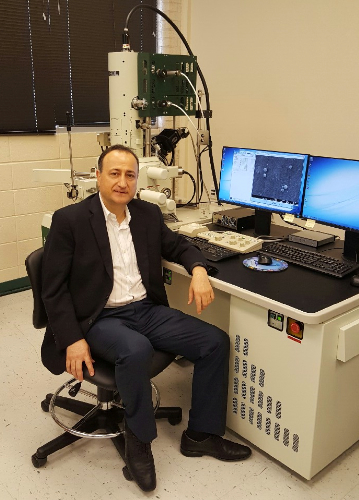 (Dec. 2014) Dr. Karen Martirosyan, Associate Professor of Physics was recently awarded DOD grant to install a cutting-edge commercial multi-functional instrument, a high resolution analytical Field Emission Scanning Electron Microscope (JSM-7100FA, JEOL). DOD funding for this project is $433,500 for one year. The instrument will support fundamental and interdisciplinary DOD related research and educational projects in the Rio Grande Valley (RGV) region of South Texas. The JSM-7100FA is a major visualization tool applicable to a diverse range of research disciplines. This new generation of variable-pressure SEM is able to image features close to resolution ~1 nanometer and obtain quantitative analytical information from regions only a few atoms across. The system also includes Energy-dispersive X-ray spectroscopy (EDS), Wavelength-Dispersive X-ray Spectroscopy (WDS), and Electron backscatter diffraction (EBSD) detectors that allow for qualitative determination of the elemental composition and the crystallographic orientations of a specimen, including luminescent materials. The instrument will be an important tool to establish strong, collaborative research in engineering, physics, chemistry, and biomedical applications (collaborators: Drs. Touhami, Islam, Kazansky, Trad and Uddin). (Dec. 2014) UTB/TSC physics student Alejandro Reyes has been accepted for the University of Maryland winter physics and astronomy workshop for undergrads interested in attending graduate school in astronomy and physics. The workshop will include a weekend excursion to the National Radio Astronomy Observatory in Greenbank, West Virginia, as well as tours of local facilities such as UMD physics labs, NASA's Goddard Space Flight Center, and the National Institutes for Standards and Technology (NIST). (Nov. 2014) Congratulations to our students Ramona Luna and Mkhitar Hobosyan on winning the Best presentation awards at the 6th Annual PACE Bioethics Conference, which was held at the University of Texas Pan-American on November 4-6th. The Topic of the PACE (Pan American Collaboration for Ethics in the Professions) conference was “Bioethics & the Future of Medical Education”. Each winner was awarded a certificate and an iPad as a prize. Mkhitar Hobosyan is a PhD student in our Cooperative PhD Program with UTSA. His research is focused on fabrication of Nano- Materials for various applications, including Biomedicine (cancer treatment). His presentation title was “Microfluidics Synthesis of Magnetic Iron Oxide Nanoparticles for Hyperthermia Cancer Treatment”. His research work is under the supervision of Dr. Karen Martirosyan. 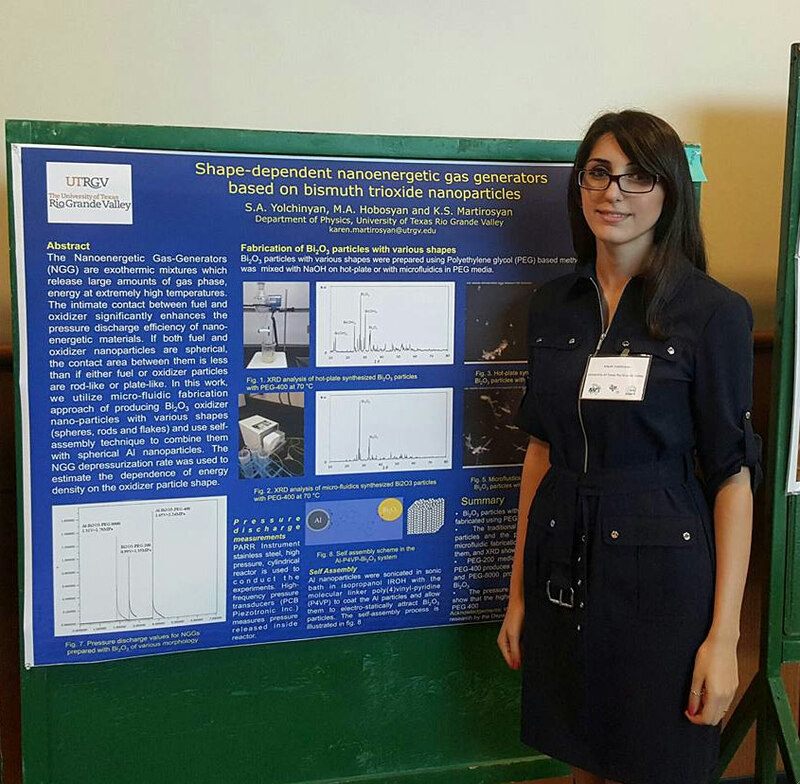 Ramona Luna is an undergraduate physics student and her presentation title was “Synthesis and Characterization of chitosan gels and films”. Her research work is under the supervision of Dr. Ahmed Touhami. She is also a MBRS-RISE Scholar. (Oct. 2014) Dr. Karen Martirosyan, Associate Professor of Physics has been awarded a patent titled "MRI Markers, Delivery and Extraction Systems, and Methods of Manufacture and use Thereof". The patent, US 8,846,006 B2, is associated with cancer research. This work is in collaboration with the UT MD Anderson Cancer Center (Prof. Steven Frank) and is related to development of a novel, non-toxic cobalt-based contrast and imaging agents for use in enhanced medical imaging for therapeutic applications. This patent is an important milestone towards further commercialization of the MRI implantable markers in clinical use because it further elaborates ways of effective cure of cancer by using magnetic resonance imaging in the planning, treatment, and post-implant evaluation for brachytherapy for disease in various organs including the prostate, head and neck, breast, lung, brain, GI malignancies and sarcomas. The positive-signal 'MRI Marker' markers have already received FDA 510(k) clearance that can utilize real-time MRI-guided procedures, including prostate brachytherapy. The permanently implantable MRI marker technology allows improvement of positive MRI seed localization after brachytherapy offered to more than 200,000 men diagnosed with prostate cancer in the U.S. each year. (Sept. 2014) Forrest Shriver, an undergraduate student in the department of physics and astronomy, has received an award of $2,000 from the American Physical Society. It is an application-based scholarship for physics majors at minority serving institutions, and is contingent upon the student being in good academic standing during the time of the scholarship. The scholarship can be renewed again for another year at $3,000/year. (Sept. 2014) Governor Rick Perry announced at the groundbreaking ceremony for SpaceX an investment of $9 million to UTB/TSC for the creation of STARGATE: a research center of excellence for the development of radio systems based on phased-array technology. (August, 2014) SpaceX ended months of speculation that the rocket company would chose Cameron County and build the world’s first vertical rocket launch site at Boca Chica Beach to complement its existing launch sites at Vandenberg, California, and Cape Canaveral, Florida. (June, 2014) UTB/TSC team, led by physics undergraduate student Ali Amir Aldan and including physics major Satzhan Sitmukhambetov and computer science major Raynaldo Rae, participated in the recently concluded World Finals of the prestigious International Collegiate Programming Contest (ICPC) held at the Ural Federal University in Russia. The team finished 19th among more than 120 regional winners from all over the world, beating MIT (24th), Univ. Southern California (42nd), Univ. of Wisconsin, Madison (56th), Stanford Univ. (57th), Univ. Michigan, Ann Arbor (67th), Iowa State (81st), Univ. Chicago (86th), Univ. California, Irvine (88th), Virginia Tech (92nd), Carnegie Mellon Univ. (97th), Univ. of California, Berkeley (102nd) and Northwestern Univ., Univ. of Maryland (tied at 103rd). The only team from the U.S. ranked above UTB/TSC is New York University (13th). 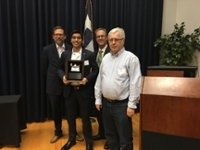 The team had earlier won the Texas regional contest sponsored by IBM, beating 56 other teams including Rice University, UT Austin, UT Dallas, Texas A&M and others. 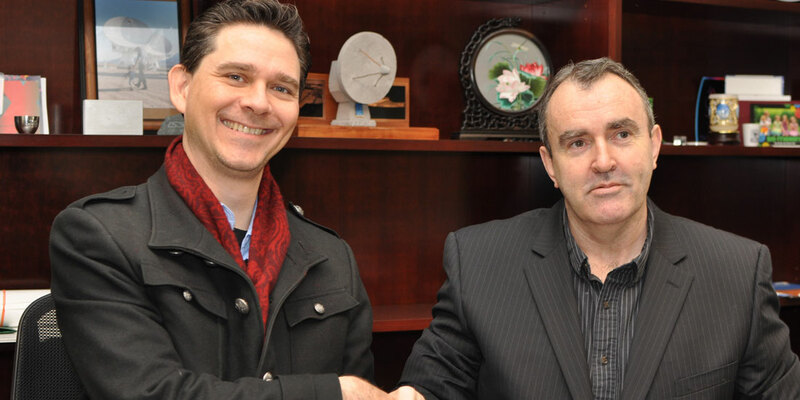 (June, 2014) The University of Texas, Arlington (UTA) and the University of Texas at Brownsville/Texas Southmost College (UTB/TSC) have signed a memorandum of understanding (MOU) to offer a cooperative doctoral program in physics. Starting Fall 2014, doctoral students admitted to UTA under this cooperative doctoral program can reside at UTB/TSC and carry out their research under the supervision of a UTB/TSC physics and astronomy department faculty member. Five students who will be graduating with M.S. Physics degree by summer 2014 at UTB/TSC will join the first cohort of this program. The new cooperative doctoral program will foster joint collaborative education and research advances between the two universities that will enrich the RGV students. (June, 2014) Professors Malik Rakhmanov, Soumya D. Mohanty and Soma Mukherjee were invited to deliver a series of lectures on topics of advanced signal processing, data analysis and data mining at an International Summer School held at the Eurasian National University (ENU), Kazakhstan in May 2014. The summer school also featured faculty members from several universities in the U.S. and Europe. During the school, Drs. Rakhmanov, Mohanty and Mukherjee met with the Vice-Rector of the ENU and the Kazakhstan science funding agency representatives. There was tremendous interest to collaborate with the Physics faculty members at UTB/TSC in the area of scientific computing and astroinformatics. A team of ENU graduate students will visit our department in Fall 2014. More extended research visits by graduate students, fully funded by their national funding sources is expected to start soon. Plans to set up a dual M.S. degree program is in the cards. 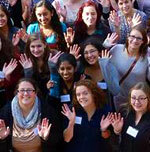 The University of Texas at Brownsville/Texas Southmost College has been selected as the site for a 2015 Conference for Undergraduate Women in Physics (CUWiP). This event will be a three day regional conference for undergraduate physics majors. The conference organizer is Dr. Cristina Torres. More info on the CUWiP. (March, 2014) UTB/TSC Physics student Jose McKinnon has been selected by NASA as one of 105 top-performing interns, representing 29 states and 67 universities, inducted into NASA's 2014 Student Ambassadors Virtual Community. The NASA Student Ambassadors Virtual Community (NSAVC) is an online network designed to foster greater interaction and mentorship among outstanding interns of NASA higher education projects. This is the sixth group of student ambassadors to receive the honor since 2009. Student Ambassador Profile. The UTB/TSC nanoscience certificate program exposes students to nanotechnology areas as part of broader approach to integrate nanoscale education in UTB/TSC’s undergraduate programs. This option prepares students for the emerging market of nanotechnology research and industry by providing basic scientific and research skills. (Feb, 2014) Applications for the Research Experience for Undergraduates (REU) at UTB/TSC are due on February 15, 2014. Selected students will spend the summer at UTB/TSC working on research projects in astrophysics, biophysics, gravitational wave detection, lasers and photonics, nano-science and advanced materials or radio, optical astronomy and applied physics. Participants will receive a stipend of $5,000, travel support up to $600, and room and board. (Feb, 2014) NASA scientists and engineers will visit UTB/TSC to recruit students for paid summer internships at NASA centers. Students must attend an information session on Tuesday, Feb 11 or Wednesday, Feb 12 to qualify for an interview on Thursday, Feb 13. Faculty are invited to a brown bag networking lunch with NASA personnel Wednesday, Feb 12 12:30-2pm in Gran Salon. (Feb, 2014) The UTB/TSC Department of Physics and Astronomy is currently hosting a poster contest for high school students. Teachers have nominated students interested in physics and astronomy to participate in the contest by working with a faculty mentor to produce a poster on a research topic. The student posters will be presented in a public event at UTB/TSC on Saturday, February 15 4-6pm in Salon Cassia. All participants, families, classmates, and the public are invited to attend. (Nov, 2013) UTB/TSC's team "Ocelot", led by physics undergraduate student Ali Amir Aldan, has won the prestigious International Collegiate Programming Contest (ICPC) sponsored by IBM, beating 56 other teams including Rice University, UT Austin, UT Dallas, Texas A&M and others. The two other members of the team are Physics major Satzhan Sitmukhambetov and Computer Science major Raynaldo Rae. 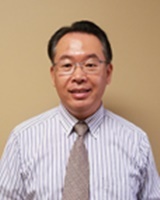 The team has been coached by Dr. Liyu Zhang, an Assistant Professor in the Computer Science Department at UTB/TSC. Team Ocelot will now participate in the World Finals to be held at the Ural Federal University in Russia (http://icpc.baylor.edu/) in June 2014. Twenty one teams from North America including MIT, UC Berkeley, Stanford University, Carnegie Mellon University etc. along with UTB/TSC will participate in the World Finals (http://icpc.baylor.edu/worldfinals/teams). Professor Bakhyt Matkarimov, a visiting professor from Kazakhstan at the Center for Gravitational Wave Astronomy (CGWA), has been coaching Ali Amir Aldan and Satzhan Sitmukhambetov since their high school years at Kazakhstan before they were recommended to join UTB/TSC Physics department under the mentorship of Dr. Malik Rakhmanov, Assistant Professor in the department of Physics and Astronomy. Dr. Matkarimov is a Member of the International Scientific Committee for the International Olympiad in Informatics, which is one of the most challenging competitions for students. He is also been appointed Chairman of the Jury of the Kazakhstan sub-region of the Northeastern European Regional Contest of ACM ICPC. 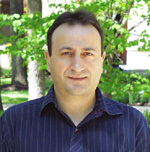 Professor Matkarimov has trained many of the current UTB/TSC physics students over the years. Darkhan Tuenbayev (currently a Doctoral student under Dr. Malik Rakhmanov's supervision in the UTB/TSC-UT San Antonio cooperative Ph. D physics program) had won the Middle Asia of ICPC in 2007 and participated in the ICPC World final at Tokyo, Japan, the same year. Ali-Amir Aldan had earlier won the Bronze medal, International Olympiad in Informatics (IOI) in 2011 (Canada) and the Silver medal in 2012 (Thailand). Satzhan Sitmukhambetov had won the Gold medal at the Kazakhstan National Olympiad. The department wishes the team all the very best for a successful performance at the World Finals! Physics Student Lands Internship at Facebook, Inc.
Ali-Amir Aldan, a sophomore physics major at The University of Texas at Brownsville/Texas Southmost College, hit the jackpot with his summer internship at Facebook in Menlo Park, California. As a member of Kazakhstan's national competitive programming team, he selected UTB/TSC upon recommendation from his coach to work with Dr. Malik Rakhmanov, Assistant Professor of physics at the Center for Gravitational Wave Astronomy, who is originally from Kazakhstan. Aldan's participation on his country's national competitive programming team put him in a position to be spotted by Facebook, and the company contacted him for the summer internship. 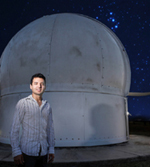 Jose Guadalupe Martinez, an ARCC Scholar in the physics department at UTB/TSC discovered the 10th double neutron star system known to man. 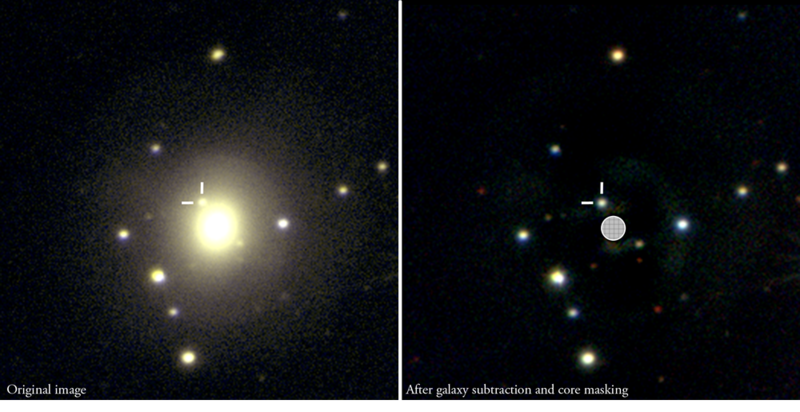 This unique astronomical phenomenon was discovered in the Arecibo All-Sky 327 MHz Drift Pulsar Survey on August 10, 2012. When it was first discovered it was not easily distinguished as a double neutron star system but a few parameters gave enough information to suggest the probability of being one. A proposal was sent in at the end of the same month to the Arecibo Observatory for a years worth of following up,with the purpose of identifying what class of pulsar it was. After observing it for some time, and noticing the change of the pulsar's period over several days during observation, it was confirmed that the pulsar was indeed in a rhythmic dance, orbiting with another star. Shortly after, the orbit of the system was preliminary solved giving an estimate of the companion mass star orbiting the pulsar, resulting in the same mass of a neutron star. After this discovery was made another proposal was sent in to Arecibo for a week's straight follow up time. Which gave enough time to have a full orbit observation, the period of the orbit's system is 4.07 days. These observations were led by ARCC scholars on-site at the Arecibo Observatory. After having all that data, the system was solved confirming it as the first asymmetric double neutron star system with precise mass measurements. As the double system started yielding its secrets, it became clear Jose Guadalupe Martinez had discovered a double neutron star. (Oct, 2013) This year the Physics Department hosts the 2013 Joint Meeting of the Texas Sections of the APS, AAPT, and Zone 13 of the SPS. This is the first time UTB/TSC was selected by the Texas Section of APS to host the meeting. The Conference will take place on campus at UTB/TSC and will begin on October 10th. Approximately 200 participants will attend the meeting which includes nine topical sessions covering all areas of physics, the plenary and the poster sessions, and the workshop for students called "Industrial Careers for Physicists." Invited talks will take place Friday and Saturday morning. Among the guest speakers are Robert Curl (Nobel laureate, Chemistry 1996), Barry Barish (Director of the International Linear Collider), and Ray Baughman (Director of the MacDiarmid Nanotech Institute). (Oct, 2013) The Center for Gravitational Wave Astronomy at The University of Texas at Brownsville/Texas Southmost College will commemorate 10 years of research with the CGWA Science Festival from 3 p.m. to 8 p.m. Saturday, Oct. 12 at the Student Union. "Science festivals are designed to engage the community through inspiring celebrations of the fascinating world of science and technology," said Dr. Joey Shapiro Key, Director of Education and Outreach for the Center for Gravitational Wave Astronomy. "The community is invited to participate in fun events and interact with scientists and engineers showcasing art and science collaborations and innovative ways to communicate science topics. We want everyone to have access to the exciting science work that is happening right here in our community." (Aug, 2013) The University of Texas System proposed Brownsville as the site of the "first designated research unit" for the Valley's new university in partnership with SpaceX, according to a recently release August letter. Nine students from all over the country performed research with UTB/TSC physicists this summer as participants of the Physics Research Experiences for Undergraduates (REU) program. Five UTB/TSC students also participated in this program that is made possible by a grant from the National Science Foundation. Dr. Mario Diaz, professor of physics and director of the Center for Gravitational Wave Astronomy, is the Principle Investigator of the grant and Robert Stone, a Faculty Associate in the Department of Physics and Astronomy, directs the program. The Research Experiences for Teachers (RET) program ran concurrently with the REU program. The RET program provides local high school science teachers with an opportunity to work with UTB/TSC physicists. The teachers gained insights into the research performed here, and they can now share these insights with their students. Summer 2013 marked the second year of the program that is funded for three years. In 2012 there were 25 applications for the program, but the number of applications skyrocketed to 180 this past year. The students and teachers worked in a variety of fields, including biophysics, astronomy, and nanoscience. Participants from outside UTB/TSC were Catie Raney, University of Oklahoma, Nicole Gagnon, Duke University, Sam Passaglia, University of Pennsylvania, Shane Mitchell, Dickinson College, Kyle French, Illinois Wesleyan University, Peter Chi, Rutgers University, David Garza, UT-Pan Am, Justin Tervala, University of Maryland, and Adan Anchondo, UT-El Paso. UTB/TSC participants were Erin Ferrell, Francisco Lozano, Wahltyn Rattray, Jaime Romo, and Shangir Siddique. RET participants were Alan Hendrick from Veterans Memorial HS, Anthony Lehmann, Jr. from Harmony Science Academy, and Julio Sada from Brownsville Early College HS. (Aug, 2013) The National Science Foundation (NSF) has awarded the UTB/TSC Center for Gravitational Wave Astronomy a grant titled: "USA-Argentina collaboration: developing an astronomical site for Multimessenger astronomy in Cerro Macón, Argentina". The NSF Office of International Science and Engineering made this award under a funding opportunity called "Catalyzing new international collaborations". The goal of this project is to establish a partnership between American and Argentine astronomers to build and operate an astronomical facility in Cordon Macon, a mountain located in the Atacama highlands of Northwestern Argentina. The Atacama plateau is the driest place in the world, making it ideal for astronomical observations. This facility would be dedicated to observe and study astronomical phenomena like explosions of massive stars and the collision of pairs of neutron stars (very compact, old and distant stars). These rare cataclysmic collisions are most likely associated with the emission of very energetic particles called gamma ray bursts and could well be the origin of the production of heavy elements found only in small amounts on earth like gold. The radioactive glow of these explosions could be detected as what astronomers have called a "kilonova" and also be a source of gravitational waves (ripples in the fabric of space caused by these collisions) that could travel far away and be detected on earth with very powerful lasers detectors like the LIGO observatories. Observatories like these could be helpful to make simultaneous observations of these events with different instruments and confirm gravitational wave detections. The grant will pay for travel to Argentina by scientists and students from The University of Texas at Brownsville/Texas Southmost College and Texas A&M University, the American institutions partnering in this collaboration with Argentine astronomers. (April, 2013) At the fifteenth annual UTB/TSC research symposium, Physics students Francisco Lozano and Jose Puente orally presented on the topic of "Mapping Magnetic Fields in 3D Space Utilizing Commodity Hardware." The students, under the supervision of their faculty mentor, Dr. Cristina Torres, managed to win the top spot in the undergrad division, scoring a big win for the physics department, and further advancing the goals of the Center for Gravitational Wave Astronomy. Dr. Malik Rakmanov and Dr. Volker Quetschke were awarded a $623,860 dollar grant to perform research in collaboration with Dr. Xu of Rice University. The research will focus on the area of nano-photonics and to study light at the nanoscale for telecommunications and computation. The grant will enable a postdoctoral research assistant and a graduate student at the university to work alongside the professors. The students working on the research will travel to Rice University to fabricate micro toroidal resonators using E-beam lithography instruments. Much of the work will occur in the university's Optics and Nanophotonics Lab in the Science, Engineering and Technology Building at The University of Texas at Brownsville/Texas Southmost College. Our department is always encouraging research, said Dr. Soma Mukherjee, Associate Professor and Chair of the Department of Physics and Astronomy. The more we expand into newer areas the more opportunities it opens up for our students and for emerging and new kinds of research. One year after receiving his BS in physics from UTB/TSC Sergio Cantu was awarded a National Science Foundation (NSF) Graduate Research Fellowship. The fellowship will provide Sergio with a three-year annual stipend of $30,000 and $10,500 for tuition and fees. He currently attends the Massachusetts Institute of Technology but the fellowship will allow him to do his research at any accredited US graduate institution. Congratulations to physics graduate student Liliana Ruiz-Diaz for being named the Outstanding Female International Student by the Office of Global Engagement. She was awarded a plaque and scholarship on March 8 as part of the International Women's Day observance. Liliana was chosen from among 17 women who were nominated by faculty members. "I feel really happy for this recognition because I am representing a very narrow group, foreign female students working in the physical sciences. I think that this type of award encourages women to exceed expectations," said Liliana. She continued, "I am very grateful to the Office of Global Engagement for this award and also to my advisor, Dr. Malik Rakhmanov, for nominating me." Dr. Rakhmanov, an assistant professor in the Department of Physics and Astronomy, observed, "Liliana doesn't just study to get a degree -- she wants to become a scientist." He believes that Liliana's accomplishments can serve as an example to other students. "I would say the important point here is to believe in your own abilities. I often tell the students that they can always succeed if they really want something. Liliana's award is yet another a proof of this point," he noted. Liliana received her BS in physics in spring 2012 at UTB/TSC. During her time here she has participated in research internships at MIT and The University of Texas at Austin. Throughout her time at UTB/TSC she has been very active in the Society of Physics Students and in departmental outreach activities in addition to performing cutting-edge research in the department's Optics and Nanophotonics lab. Dr. Matthew Benacquista publishes Astrophysics book. Dr. Matthew Benacquista has published a book titled 'An Introduction to the Evolution of Single and Binary Stars'. The publisher is Springer. The book features an introduction to the Evolution of Single and Binary Stars. Concepts of astronomy, stellar structure and atmospheres, single star evolution, binary systems and mass transfer, compact objects, and dynamical systems are covered in the text. The book in targeted at advanced undergraduate students in physics and astronomy. The Optics and Nanophotonics Laboratory and the Advanced Nanoscience Laboratory have transformed the physics research that takes place at the University of Texas at Brownsville/Texas Southmost College. The impact of these facilities was emphasized in a formal public ceremony that took place on April 25th in SETB. The College of Science, Math, and Technology Advisory Boa rd and members of the community toured the labs as part of the ceremony. The National Science Foundation has awarded an equipment grant to a professor working in the recently opened Biomedical Research and Health Professions Building II. Dr. Ahmed Touhami received a $276,233 grant from the NSF's Major Research Instrumentation Program for the acquisition of a top-of-the line microscopy technique. Touhami, the grant's principal investigator, will acquire a multi-functional Integrated Fluorescence/Atomic Force Microscope to measure biophysical, chemical and physical properties at the nanoscale for single molecules. The Center for Gravitiational Wave Astronomy (CGWA) at the University of Texas at Brownsville/Texas Southmost College is pursuing astronomy around the globe. Two CGWA faculty, Dr. Mario Diaz and Dr. Cristina V. Torres along with a CGWA graduate student Samanta Fuentes Tapia are currently on an expedition in the Argentinian Andes with several collaboration partners from Texas A&M. Several local high school students had the opportunity to expand their universe during the 9th annual 21st Century Astronomy Summer Ambassadors Academy that began on June 10. This popular summer program allows students to become involved in relevant real-world research during the three-week program. Congratulations to UTB/TSC's inaugural members of Sigma Pi Sigma, the national physics honor society. UTB/TSC and UTPA physics students were inducted in a ceremony on May 3rd at UTPA's Coastal Studies Laboratory on South Padre Island. for more information. (April, 2013) Dr. Joe Romano will present the talk Escher Part II: Playing with perception at Monday Night Physics, which will take place on April 29, 2013 in BRHB 1.222 at 7:15pm. This is the second of two lectures about mathematics, perception, and the art of M.C. Escher. The community is cordially invited to attend. (Jan, 2013) Monday night physics is back for 2013 Comes Join us with Dr. Joseph Romano, professor in the Department of Physics and Astronomy. He will deliver a public lecture titled Learning math from the prints of M.C. Escher on January 28 as part of the Monday Night Physics Lecture series. The lecture will take place at 7:00pm in BRHB 1.222. The community is cordially invited to attend. The Long Wavelength Array (LWA) is a proposed low frequency radio observatory to be built at many sites in the southern United States. The observatory will be composed of 50 stations each containing 256 dipole antennas. The first station, LWA1, was constructed in New Mexico near the Very Large Array (VLA). 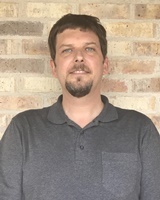 A UTB/TSC graduate student, Kevin Stovall, assisted the LWA team by writing software which puts the data in a form which is easily readable by existing pulsar search algorithms. Mr. Stovall's work was featured prominently at a meeting of the National Science Foundation which reviewed the status and capabilities of the new instrument. 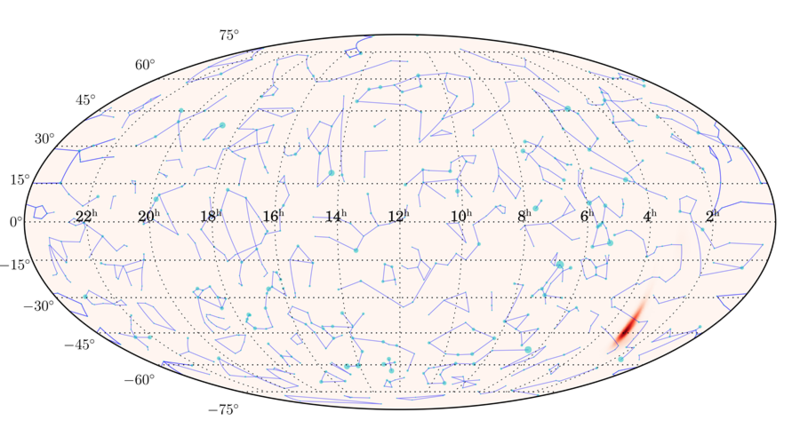 His software generated plots, like the one shown below, of the first LWA observation of a radio pulsar. These plots convinced the NSF panel that the LWA was functioning as expected. Mr. Stovall is a student enrolled in the Ph.D. in Physics Cooperative between The University of Texas at San Antonio (UTSA) and UTB/TSC. This cooperative allows students enrolled in the UTSA Ph.D. Physics program to conduct research at UTB/TSC under the direction of a graduate faculty member of the UTB/TSC Department of Physics and Astronomy. The National Science Foundation has awarded $200,000 to University of Texas at Brownsville/Texas Southmost College for support of a new project, entitled "Development of the Nanoscale Engineering Concentration (NEC) at the University of Texas at Brownsville/Texas Southmost College." The interdisciplinary project is under the direction of Karen Martirosyan, Ahmed Touhami and Malik Rakhmanov (Physics and Astronomy), Davood Askari, Nazmul Islam (Engineering Physics) and Tarek Trad (Chemistry). This award is effective October 1, 2011 and continues until 2013. The grant will work towards establishing a Minor in Nanotechnology in the College of Science, Math and Technology. Prof. Karen Martirosyan has been awarded an NSF MRI grant. The project is entitled “MRI-Consortium: Acquisition of Cryogen-free Cryocooler-based Physical Property Measurement System to Support Transformative Device and Materials Research in the Rio Grande Valley”. NSF funding for this project is $437,970 for two years. The objective of this grant is to acquire a cutting-edge commercial multi-functional instrument Cryogen-free Cryocooler-based Physical Property Measurement System (PPMS EverCool–II, Quantum Design, USA) to support fundamental and interdisciplinary research projects and the applied physics education program in the Rio Grande Valley, South Texas region. The PPMS will be installed at the University of Texas at Brownsville/Texas Southmost College and will be used as a shared characterization facility. This instrument is designed to measure a variety of materials properties including magnetic, transport, and thermal under different temperatures (1.9 - 1000 K), magnetic fields (up to 9 T) and environments (from atmospheric pressure to high vacuum). The system is cryogen-free and no costly liquid cryogens are required. The attractive feature of the PPMS is a cryocooler to achieve cryogenic temperatures. The PPMS EverCool–II is a highly automated instrument. It can perform unattended measurements after the user has installed a sample and configured the measurement. This acquisition will enhance the existing research and educational infrastructure and will provide the state-of-the-art measurement system to a broad range of users in State of Texas, thereby elevating advanced materials research and educational programs in the Rio Grande Valley to a globally competitive level. The instrument will be a great addition to establish a strong collaborative research in applied physics, biomedical and chemistry (collaborators: Drs. Rakhmanov, Cagnoli, Quetschke, Kazansky, Garrido and Trad). In addition, Dr. Martirosyan received grant from Air Force Research Lab (AFRL). The project is entitled “Tailoring of Pressure Discharge and Shock Wave Velocity in High Energy Density Nanoenergetic Gas Generators”. AFRL funding for this project is $65000 for one year. The funding will support research in development of novel multicomponent high energy density nanostructured materials that exhibit superior gas release and long term stability for emerging military applications. Support will be available for students in undergraduate and graduate levels. Please contact Prof. Martirosyan (karen.martirosyan@utb.edu) if you are interested. "MRI- Consortium: Acquisition of Cryogen-free Cryocooler-based Physical Property Measurement System to Support Transformative Device and Materials Research in the Rio Grande Valley," K. Martirosyan (PI); A. Zakhidov, D. Litvinov, M. Chipara, R. Wilkins (co-PI). The 7th Annual Gravitational Wave Astronomy Summer School (GWASS) provided a unique opportunity for rigorous intellectual challenges in the relaxed atmosphere of South Padre Island. Organized by the Center for Gravitational Wave Astronomy (CGWA), GWASS began on May 30 at the UTB/TSC South Padre Island Center with welcoming addresses from UTB/TSC Provost Dr. Alan Artibise and CGWA Executive Director Dr. Mario Diaz to the 24 graduate and advanced undergraduate students who traveled here from all over the world. In addition to enjoying balmy weather and scenic beaches, the students received an intense introduction to aspects of gravitational wave astronomy, including the astrophysics of gravitational wave sources, an introduction to general relativity, gravitational wave data analysis, and gravitational wave detector instrumentation. GWASS instructors included Dr. Teviet Creighton and Dr. Joe Romano, both from UTB/TSC, Dr. Peter Saulson from Syracuse University and Dr. Peter Shawhan from the University of Maryland. Before the school ended on June 10 the students enjoyed sunset cruises on the Laguna Madre and a tour of the UTB/TSC physics facilities. Most of the students indicated that they learned quite a bit during the two-week long school. “I learned as much in the past two weeks as I learned in the previous semester,” noted one of the participants. Some of the students who attended the 7th Annual Gravitational Wave Astronomy School enjoy a sunset cruise. Students investigate a problem in gravitational wave data analysis during the Gravitational Wave Astronomy Summer School held at South Padre Island. Eighteen motivated high school students from the Brownsville Independent School District (BISD) and surrounding areas are trained in topics of modern Astronomy including Gravitational Waves, Gamma ray and Radio Astronomy, Black Holes and Data Analysis techniques. The curriculum consists of both lectures and hands-on laboratory exercises. As a part of the program, the selected students will visit the McDonald Observatory in Davis Mountain of western Texas. In the hands-on laboratory sessions, the students learn techniques of astronomical observations and data analysis. The aim of this academy is to train the motivated high school students from the local school districts in modern astronomy to introduce them early to the fascinating cutting edge research areas in astronomy and to expose them to the research work that is being done at the Physics department at UTB/TSC. The academy is a major step towards reaching out for the local high school students. This program is now funded by the NSF until 2012. The program was put up on NSF highlights. Two students at The University of Texas at Brownsville and Texas Southmost College have been chosen to participate in the Summer Research Program sponsored by the Massachusetts Institute of Technology’s Office of the Dean for Graduate Education in Cambridge, Mass. Liliana Ruiz-Diaz, 21 a junior physics major from Matamoros, Mexico and Sergio H. Cantu, 22, a junior physics and mathematics major from Ciudad Victoria, Mexico, will start Thursday, June 5 in the two-month program ending in early August. Both are scheduled to graduate in May 2012. The research program promotes diversity, graduate education and enterprising research. The program began in 1986 and gives chosen participants opportunities to receive academic counseling, work with an MIT faculty member and graduate or postdoctoral student, listen to research presentations and work in advanced laboratories. Participants must write weekly reports detailing the progress of their work. Sergio H. Cantu will work in MIT’s Space Propulsion Laboratory to help develop a thruster that can shoot and push ion beams in more than one direction for satellites and other equipment to move in space. He will work with Dr. Paulo Lozano, MIT’s H.N. Slater Associate Professor of Aeronautics and Astronautics. “ This is aerospace and I’m a physics major,” said Cantu. “It’s one of those things I want to do before I graduate to try something else.” This will be the second summer that Cantu has been part of the program. Last year he helped build an interferometric displacement sensor. Challenger Mishra was one of approximately 1000 applicants for the prestigious Rhodes Scholarship. Now he is one of five students from his native India to be named a 2011 Rhodes Scholar. He believes that research he has done with the Center for Gravitational Wave Astronomy (CGWA) made a favorable impact with the Rhodes Scholarship selection committee. Challenger will join a select group that includes past Rhodes Scholars such as United States Ambassador to the United Nations Susan Rice, physicist Brian Greene, NFL player Myron Rolle, and Brownsville native Kris Kristofferson. The scholarship provides support to attend the University of Oxford in the United Kingdom. My internship here [at the CGWA] made a good impact in my applications to the Rhodes Scholarship. It was a very positive thing that I had done some research in gravitational waves, he noted. Challenger began working with associate professor Dr. Soumya Mohanty in 2009 on a novel algorithm to extract a certain class of gravitational wave signals from a noisy background. He explained, [The algorithm]...has been in use in other fields but it has not been used extensively for gravitational wave data analysis. Dr. Mohanty has already written a paper on it; that is probably the first paper which uses that algorithm for gravitational wave data analysis. We are trying to extend its applications.” Challenger has returned to the CGWA to continue work with Dr. Mohanty over the summer. In addition to his academic achievements at the Indian Institute for Science and Education Research in Calcutta, Challenger is a table tennis champion and he has written and starred in a play. Four students have journeyed more than 9,000 miles to work with Center for Gravitational Wave Astronomy (CGWA) physicists this summer. Faculty at the students' home institutions of the Indian Institute of Science and Education Research (IISER) in Calcutta and Pune encouraged the students to travel here to perform research in gravitational wave astronomy. Challenger Mishra, a graduate student at IISER-Calcutta, first visited CGWA in 2009 and he has returned to perform research here this summer. In 2009 he began working with Dr. Soumya Mohanty on an algorithm to extract a certain class of gravitational waves from a noisy background, and they have remained in contact and have continued to work on the algorithm since then. In the fall Challenger will enter the University of Oxford as a Rhodes Scholar, and he credits his first project at UTB/TSC with Dr. Mohanty as a major factor in his selection as a Rhodes Scholar. In addition to collaborating with Challenger Dr. Mohanty is mentoring two of the undergraduate students this summer. Dr. Mohanty is supervising Swetha Bhagwat's data analysis project aimed at identifying noise sources in the gravitational wave detector, and he is mentoring Santosh Sundaresan as he applies the data analysis technique of regularization to gravitational wave data. Dr. Soma Mukherjee, chair of the Department of Physics and Astronomy, is overseeing Avani Gowardhan in her work of applying a technique known as Blind Source Separation to identify noise sources in gravitational wave detectors. Swetha and Avani are undergraduate students at IISER in Pune, and Santosh is a student at IISER in Calcutta. From left to right: Avani Gowardhan, Santosh Sundaresan, and Swetha Bhagwat are undergraduate students from India working this summer with CGWA physicists. This is the third year of the summer internship program. In the past, students from reputable universities in India and China have participated in the Physics and Astronomy department's undergraduate research program and have worked with the department's faculty members on theoretical and experimental physics. One of them, Yan Wang from Nanjing University in China, published a paper with Dr. Mohanty based on work done during the visiting period at UTB/TSC. Yan Wang is now a graduate student at the Max Planck Institut fur Gravitationsphysik in Hannover, Germany. Karen Martirosyan, Associate Professor, has been awarded a prestigious 2011 Air Force Summer Faculty Fellowship to perform research on nanoenergetic materials at Eglin Air Force Base in Florida. The 10-week program provides him the opportunity to forge professional relationships with scientists and engineers at the Air Force research facility, to perform high-quality research, and to gain awareness of Air Force research interests. Congratulations to the winners of the First Inaugural UTB/TSC Physics Poster Contest for High School Students! The winners of this contest, organized by the UTB/TSC Physics and Astronomy Department, were announced March 26. The goal of the contest was to connect local high school students with mentors from the Department of Physics and Astronomy in order to create scientific posters based on the research conducted here. Abid Hussain of Porter High School worked with Dr. Matt Benacquista and took the first place for his poster entitled "The Correlation Between Pulsars in a Globular Cluster to the Cluster's Concentration". Hanna High School student Patricia Alvarado won the second place with her poster "Dynamics of Bacteria Pili at the Nanoscale using Atomic Force Microscopy" based on the work she did with Dr. Ahmed Touhami. The third place winner was Sarah Rios, also a Hanna High School student, for her poster "Effect of Noticeable Seismic Activity on Various LIGO Data Outputs". Sarah's mentor was Robert Stone. The winners earned cash prizes and letters of support from their mentors. The contest was organized by Associate Professor Karen Martirosyan and Assistant Professor Gianpietro Cagnoli, and Director of Education and Public Outreach Robert Stone. The 7th Gravitational Wave Astronomy Summer School will take place this year from May 30-June 10 at South Padre Island, Texas. The program is aimed at senior undergraduate and beginning graduate students. Leading experts will provide an introduction to gravitational wave science, including an introduction to general relativity, the astrophysics of gravitational wave sources, gravitational wave data analysis, and gravitational wave detector instrumentation. Scholarships for lodging and travel support are available. The deadline to apply is March 4. Physics Poster Competition for High School Students. The Physics & Astronomy Department is organizing a Poster Contest for junior and senior high school students. The students, nominated by their teachers, have to express three preferences of physics topics. This will help the Organizing Committee to assign a different topic to each student participating to the contest. Further information can be found in the Announcement. Important dates: submission nomination form deadline 01/09/11; starting day 01/15/11; final day and award ceremony 02/19/11. This winter break, students will get an opportunity to find their inner warrior and battle ignorance of physics with a lethal arsenal. The Department of Physics and Astronomy will offer students an opportunity to learn algebra-based physics through video games in the courses Elementary Physics with Video Games and the associated lab course. Associate Professor Soumya Mohanty will teach the innovative classes during the Winter Break session which will take place December 15-22 and January 3-13. Students can now register through Scorpion Online for PHYS 1310-01 and PHYS 1110-01. Students from the Department of Physics and Astronomy amazed children with virtual images, flying metal rings, and objects that seemed to defy gravity at the Austin Science and Engineering Festival that took place on October 23-4 in Austin. Professor Mario Díaz also contributed to the event with a public lecture on gravitational wave astronomy on the 24th. The family-oriented festival featured approximately 100 exhibitors with interactive demonstrations, and organizers estimate that approximately 13,000 people attended the event. Physics students Gamage Dannangoda, Jie Hu, Luo Jing, Marc Normandin, Razib Obaid, Papia Rizwan, Thalina Weerathunga, Chuchu Xiang, Ting Zhang and adjunct faculty Omar Garcia and Robert Stone divided the day-long sessions into shifts in order to stay refreshed for the waves of energetic participants. The physics students enjoyed interacting with the enthusiastic crowds and took up the challenge of explaining physical phenomena in the most basic terms. “I initially thought that I might be nervous, but that quickly went away when I saw how everyone was there because they truly liked science and wanted their children to experience such things as well,” noted doctoral student Marc Normandin. Regarding the challenge of interacting with young children he said, “It was fun and easier than I had imagined. I learned that to explain the objects to the students, and how the objects worked, I needed to use analogies with things the children may have already experienced, such as magnets...”. In addition to the physics demonstrations the department personnel also spent time discussing the physics research that takes place at UTB/TSC with the adults who were present. This event was one of the many outreach activities undertaken by the Department of Physics and Astronomy. The United Nations World Space Week Program has selected the Center for Gravitational Wave Astronomy of the Department of Physics and Astronomy at UTB/TSC to host the Lower Rio Grande Valley TX, World Space Week. The celebration will take place in both the ITECC Center and the main campus. In the ITECC Center, guests will enjoy various activities relating to space exploration and the mysteries of the cosmos including a planetarium and 3D visualization of our solar system. At sunset, the activities will move to the SETB building, where the Arecibo Remote Command Center and its scholars will present entertainment for all ages as they showcase - how our own valley youth has discovered new stars! Meanwhile, the Nompuewenu Astronomical Observatory and the parking lot of the SETB building will be equipped with telescopes for the interested crowd of people to view the setting sun, Venus and Jupiter. There will be a special screening presentation of the movie ‘Orphans of Apollo’ directed by Mr. Michael Potter. The Department of Physics and Astronomy proudly congratulates Wanda Wiley. Ms. Wiley was one of the two university staff members recognized as a 'Most Outstanding Employee' for the past academic year by the Academic Affairs Division of UTB/TSC. The award was presented to recognize her exceptional support of the department in Fall 2009. She was nominated for the award by department chair Dr. Soma Mukherjee, and her nomination was then taken up by a university committee that made the final decision. Ms. Wiley has been employed at UTB/TSC for the past five years. The department of Physics and Astronomy proudly congratulates two students. Undergraduate student Ms. Liliana Ruiz and graduate student Pablo Hernan Daveloza were recognized by the University of Texas at Brownsville/Texas Southmost College for Scholastic Excellence. The awards are based on academic performance of the students throughout the year and also their research involvement and excellence beyond curriculum. Lilliana is a sophomore working under the supervision of Dr. Malik Rakhmanov in Experimental Physics. 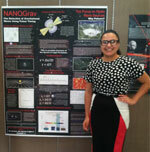 Liliana collaborates with the Nanotechnology group at the University of Texas at Dallas. She is also a regular participant in the physics department journal club that provides a platform for undergraduate and graduate students to discuss and learn about recent developments in physics research. Pablo Daveloza is seeking an M.S. degree in physics this Spring. Pablo works under the supervision of Dr. Mario Diaz on Laser Interferometric Gravitational Wave Observatory's (LIGO) detector calibration research. He received a prestigious LIGO research prize in 2009. 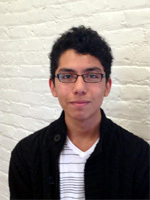 Pablo will be joining the University of Texas at San Antonio in Fall 2010 to seek a PhD in Physics. Three undergraduate students from the Department of Physics and Astronomy were recently accepted into prestigious summer research programs. Sergio works in the laser and optics group in the department under the supervision of Dr. Malik Rakhmanov. He has previously worked at the Laser Interferometer Gravitational-Wave Observatory as part of a team that made a vital component for the observatory’s powerful laser. 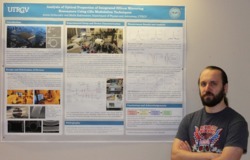 Last year his poster describing his work won a first prize in its category at the joint meeting of the National Society of Black Physicists and the National Society of Hispanic Physicists. Anthony is a member of the pulsar astronomy group in the department and is supervised by Dr. Fredrick Jenet. In addition to being a member of the team that recently discovered new pulsars he was recently listed as a co-author on a discovery about signal propagation through space that was featured by the IOP. 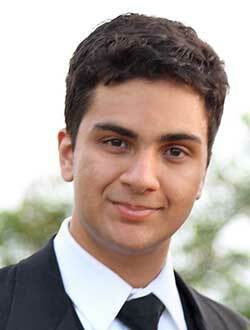 Senior Razib Obaid has been accepted in the Caltech SURF program. This program gives opportunity to students to get involved in research under the supervision of research mentors at Caltech and Jet Propulsion Laboratory (JPL). Razib will be spending three months this summer at Caltech, working on gravitational wave search with Dr. J. Betzwieser. Their acceptance into these national programs indicates the high the quality of research they are performing as undergraduate students. Physics and Computer Science faculty members secure a National Science Foundation MRI award to acquire a supercomputing facility. Faculty members from the Physics (S. Mukherjee, M. Benacquista) and Computer Science (H. Lei, J. Iglesias) have received an award from the National Science Foundation’s MRI program to acquire a supercomputing facility. The computer cluster, to be named “Futuro”, will serve major computing needs associated with the gravitational wave data analysis and detector characterization research projects. Futuro will also serve as a facility for other high performance computing projects such as running Photonics codes. Futuro succeeds the Physics department’s current cluster, “Funes”, acquired in 2004. The Dept. of Physics and Astronomy is pleased to host graduate students from abroad to collaborate with the faculty members for their graduate research and thesis. Jin Li, from the Chongqing University, China, came to UTB/TSC in 2008 to work with Professor M. Benacquista at the Center for Gravitational Wave Astronomy (CGWA). She was the recipient of a prestigious Chinese Government Scholarship. The China Scholarship Council provides full support towards PhD research abroad under co-supervision of a US faculty member. While at UTB/TSC, Jin Li worked with the LIGO Scientific Collaboration (LSC) on the search for Gravitational Wave signals in LIGO science data. Jin Li returned to Chongqing University in February 2010 to prepare for her PhD. Maria Principe, from the University of Sannio at Benevento, Italy, is visiting UTB/TSC on a Fulbright scholarship. Maria will stay until the middle of March 2010 and will work on Gravitational Wave data analysis projects in collaboration with faculty members (S. Mohanty, S. Mukherjee) at the CGWA. UTB/TSC Master’s student Pablo Daveloza bags a LIGO fellowship! UTB/TSC Master’s student Pablo Daveloza bags a LIGO fellowship! The fellowship supports extended visits at the LIGO observatory sites and is awarded competitively among students enrolled at the member institutions of the LIGO Scientific Collaboration (LSC). Pablo plans to stay and carry out research at the LIGO Hanford site in Washington state. Nompuewenu observatory was one among a network of 25 stations used in the observation of an occultation event by a Kuiper belt object. A stellar occultation by Kuiper Belt Object 55636 was predicted to be visible at lower latitudes of the continental United States on Oct. 9 at 5:30am. Given Brownsville’s low latitude, Michael J. Person, MIT research scientist, picked the Nompuewenu Observatory as one among a network of 25 optical telescopes dedicated to observe this 30 second event. Although the event was eventually not detected by the Brownsville telescope, the non-detection was used to obtain an important constraint on the size of the occulting object. The department of Physics has its own Optical Telescope now, housed in a state of the art, on-campus observatory. The Nompuewenu observatory was inaugurated in Fall 2009 with a star party that attracted close to a thousand Brownsville residents! The 0.4 meter telescope is equipped with 3 CCDs, spectrometer and solar filters. The telescope is housed in a dome built mostly by students in the Physics department. Congratulations to the founding team behind the telescope project: M. Diaz (director), G. Valdes and A. Galan. The Center for Gravitational Wave Astronomy (CGWA) at UTB/TSC receives a major award from NASA. Several faculty members at the Center for Gravitational Wave Astronomy (CGWA) at UTB/TSC have been awarded a NASA-URC grant with a start date in Fall 2009. The award of $5 million over 5 years will support research in experimental and theoretical Gravitational Wave Astronomy. The CGWA is currently funded by a similar large grant from the National Science Foundation under its CREST program. The PIs of the NASA award are M. Diaz, R. Jenet, M. Rakhmanov, V. Quetschke and M. Benacquista. UTB/TSC Professors teach 2009 Gravitational Wave Summer School in China. The summer school on Gravitational Wave Astronomy took place in July 2009 at Kunming, China. The school was co-directed by Professor Rick Jenet of UTB/TSC and Prof. Q. Peng of Nanjing University, China, with generous financial support from the Chinese Government. Professors Teviet Creighton, Soumya Mohanty and Soma Mukherjee from the CGWA lectured at the school, which also had Drs. Steve Drasco (Caltech) and Alberto Sezana (Max Planck Institut, Germany) as professors. More than 60 advanced undergraduate and graduate students from all over China attended the school. The school enjoyed high esteem among the academic circles in China. Chinese Education Secretary of Yunnan province addressed the audience of students and professors at the opening ceremony. The curriculum comprised both lectures and hands-on laboratory exercises on various problems in gravitational wave astronomy. Several of the students from this school are likely to be joining our graduate program during Spring and Fall. Mr. Sergio Cantu, an undergraduate Physics major student at UTB/TSC was placed first among 70 competing students at the Annual conference of the National Society of Black Physicists and National Society of Hispanic Physicists at Nashville in February 2009. Cantu, along with fellow student Razib Obaid, worked at the LIGO Hanford Observatory (LHO) to design and build optical equipments under the supervision of Professor Malik Rakhmanov.